specific eradicant activity on established Powdery Mildew infection (high deposition, double pass (both directions)). a plant response to provide significant botrytis resilience and enhanced maturity when applied at the correct growth state (high deposition, double pass (both directions). specific eradicant activity on maturing chasmothecia in the canopy after harvest (high deposition single pass directed at canopy). The different combinations and rates for the different functions are shown in the table below and can be downloaded here. The recommended spray programme for the prevention and control of powdery mildew and botrytis is shown below or can be found here. The spray programme uses Protectorhml, HML32, and HML Silco, in combination with sulphur and copper fungicides. 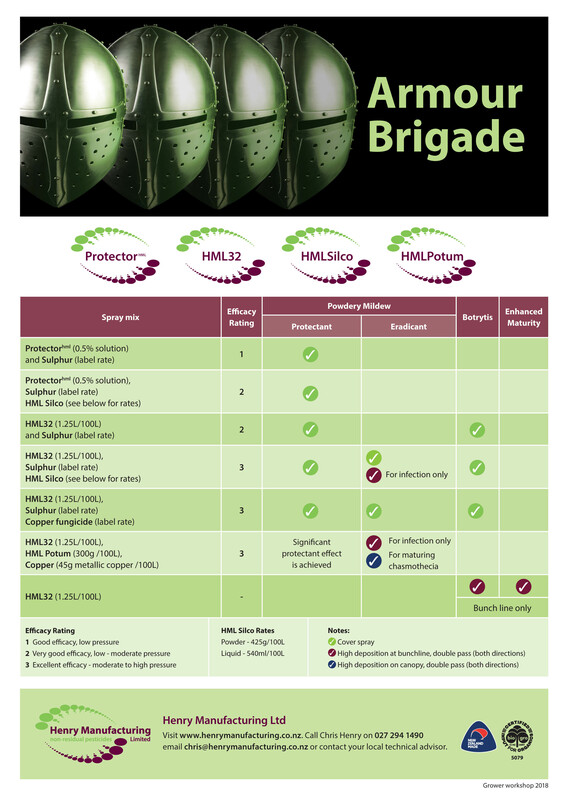 HML32 must always be used with Sulphur to provide a robust powdery mildew preventative programme. The product combinations provide eradicative/curative properties as well which is critical to a modern spray programme Copper fungicides are included to address wet weather diseases such as downy mildew, black spot and phomopsis. Applications of HML32 alone around veraison provide extra botrytis resilience. As the mode of action is contact, application technique and coverage are key to achieving maximum efficacy. Effective ‘covers’ and reasonably tight spray intervals are important during times of high growth and for susceptible varieties, likewise the replacement of ‘cover’ after significant rain events. Simple things such as alternating the spraying direction to reduce ‘shadows’ count towards well controlled disease. Please read the notes carefully to get a full understanding of the programme. View the Powdery Mildew and Botrytis Prevention Spray Programme for 2018-19. View our Best Practice - Mixing Guide for HML32. If you have not managed to prevent Powdery Mildew infection, there are TWO pathways to successfully manage them. Earlier infections are always far easier to deal with provided the applications are made in accordance with our recommended best practice. With severe infections running through to epidemics, it should still be possible to suppress well and reduce splitting. (See photographic evidence in Farmlands Adjuvant trial where Gewurztraminer was recovered from an epidemic). DO NOT include sulphur with the HML32, copper, potassium bicarbonate mix. It reduces the efficacy of the eradication sprays. Eradication sprays provide significant forward protection, sufficient that protectant sprays can be resumed subsequently at normal timings, if required. Two applications (7 days apart) are better than one. If a single application is all that can be managed – the efficacy can be improved by raising the metallic copper rate from 45g/100l to 67-90g/100l. Severe infections are more difficult to manage but you should at least be able to suppress it. Go to our Best Practice for advice in the recipe and application methods.